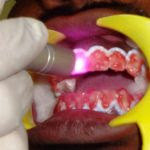 FMS Dental Hospital: Laser Teeth Bleaching & Whitening at FMS Dental Hospital Hyderabad, India. Laser Teeth Bleaching & Whitening at FMS Dental Hospital Hyderabad, India. Laser Teeth Bleaching & Whitening at FMS Dental HospitalHyderabad, India. Tooth whitening can be a very effective way of lightening the natural color of your teeth without removing any of the tooth surfaces. Entering into the amazing laser, it can whiten your smile with minimal post bleaching complications. Laser teeth whitening is the wave of the future that is in just few appointments your teeth can lighten anywhere from 5-10 shades. It is called laser whitening or ‘power whitening’. A light or laser is shone on the teeth to activate the chemical. The light speeds up the reaction of the whitening product and the color change can be achieved more quickly. Laser whitening is said to make teeth up to five or six shades lighter. Laser tooth whitening is safe and will not soften enamel or existing fillings. LASERS BETTER THAN TRADITIONAL BLEACHING? Lasers were developed for teeth whitening as traditional bleaching was too uncomfortable and resulted in inflammation as well as dentinal sensitivity. Lasers, on the other hand, can be focused on a very specific area to avoid these effects and post-operative sensitivity can be minimized. For persons who would like to save their time, laser whitening is a great way to lighten teeth. The outcome is beautiful and the investment in time is minimal. FMS dental hospitals possess special hand pieces for laser bleaching at most of its center.